Both in the community and in acute and long-term care institutions, nurses need to be particularly vigilant in protecting frail elderly patients from hypothermia. It is important to remember that the ambient room temperature and amount of clothing that a younger caregiver finds comfortable may not be sufficient for a frail elderly person. Nurses are in a key position to teach unlicensed assistive personnel and family members or other caregivers effective strategies to decrease heat loss in elders at high risk for hypothermia. Maintain the room temperature at 65 degrees Fahrenheit at a minimum; some very frail elderly people will require higher room temperatures to maintain body warmth and comfort. Clothe the person adequately and layer both items of clothing and bedcovers to provide optimum insulation. Limit the time that the elderly person is exposed to a cold area. Minimize heat loss from the head by providing a hat or scarf to cover the head and neck when possible, particularly when the elderly person is outside. Cover patients when bathing; a single bath blanket is insufficient protection against hypothermia for a frail elder. Following a bath, dry the person completely, clothe them before leaving the bathing area. Dry wet hair quickly with an electric hair dryer; do not let wet hair air dry. If the person is incontinent of urine, use absorbent pads, checking often for wet clothing or bedding. Encourage exercise to help the person generate heat from muscle activity. Provide hot, high protein meals and bedtime snacks to sustain heat production during the day and evening. Many elders who would have been institutionalized in the past are now remaining in the community where they receive nursing services. Nurses working in the community should assess the available warmth and sources of heat in the home. It is important to demonstrate to the patient and family/caregivers how to prevent heat loss, and to provide information about energy assistance programs available for elderly people with limited incomes. The exposed elderly are at particularly high risk of hypothermia and tissue damage due to heat loss. 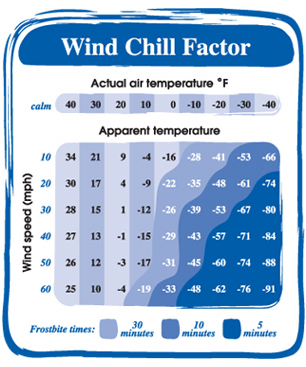 Please note that the Windchill Chart presents approximate frostbite exposure times for normal healthy individuals. Every effort must be made to protect the eldery from even short exposure to convective heat loss. The National Institute on Aging has a free AgePage that shows how to avoid hypothermia. This information can be obtained by calling 1-800-222-2225. The National Energy Assistance Referral Program (NEAR) can help seniors pay their heating bills. Be calling 1-800-674-6327, NEAR operators will give individuals the number of their state Low Income Home Energy Assistance Program office and local agency referrals for help paying energy bills. A warm air hair dryer should be used to dry the hair of persons prone to hypothermia, allowing the hair to air dry can be dangerous.